Working on the new Dell EMC Ready Solution for SQL Server was like going from 0 to 60 mph in under 3 seconds. The exhilaration of being pushed into the seat as the road roars past in a blur is absolute fun. That’s what the combination of Dell EMC PowerEdge R840 servers and the new Dell EMC XtremIO X2 storage array did for us in our recent tests. When reading about supercars, we usually learn about their 0-to-60 mph time and their top speed. While the top speed is interesting, how many supercars have you seen race by at 200+ mph? Top speeds apply to databases too. Perhaps you have read a third-party study that devoted a massive hardware infrastructure to one database, thereby showing big performance numbers. If only we had the budget to do that for all our databases, right? Top speeds are fun, but scalability is more realistic as most infrastructures will be required to support multiple databases. Dell EMC Labs took the performance scalability approach in testing the new SQL Server architecture. Our goals were aggressive: Run 8 virtualized databases per server for a total of 16 databases running in parallel, with a focus on generating significant load while maintaining fast response times. 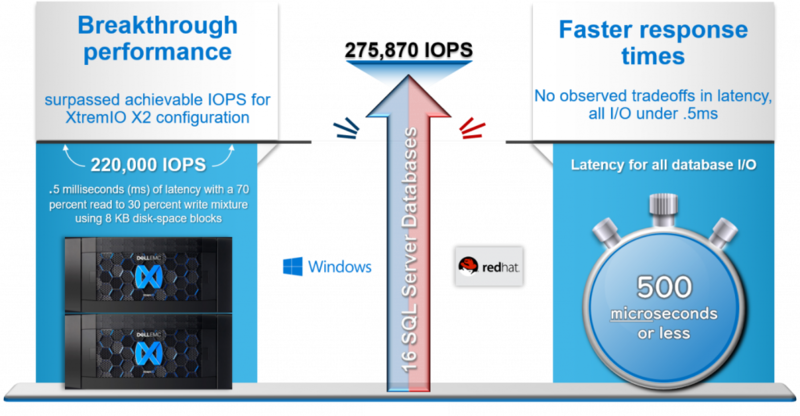 To make the scalability tests more interesting, 8 virtualized databases used Windows Server Datacenter on one server and the other 8 databases used Red Hat Enterprise Linux on another server. Figure 1 shows the two PowerEdge R840 servers and the 8-to-1 consolidation ratio (on each server) achieved in the tests. Quest Benchmark Factory was used to create the same TPC-E OLTP workload across all 16 virtualized databases. On the storage side, XtremIO X2 was used to accelerate all database I/O. The XtremIO X2 configuration included two X-Brick modules, each with 36 flash drives for a total of 72. According to the XtremIO X2 specification sheet, a 72-drive configuration can achieve 220,000 IOPS at .5 milliseconds (ms) of latency with a mixture of 70 percent reads and 30 percent writes using 8K blocks. Figure 2 shows the two X-Brick configuration of the X2 array with some of key features that make the all-flash system ideal for SQL Server databases. Before we review the performance findings, let’s talk about IOPS and latency. IOPS is a measure that defines the load on a storage system. This measurement has greater context if we understand the maximum recommended IOPS for a storage system for a specific configuration. For example, 16 databases running in parallel don’t represent a significant load if they are only generating 20,000 IOPS. However, if the same databases generated 200,000 IOPS, as they did on the XtremIO X2 array that we used in our tests, then that’s a significant workload. Thus, IOPS are important in understanding the load on a storage system. Response time and latency are used interchangeably in this blog and refer to the amount of time used to respond to a request to read or write data. Latency is our 0-to-60 metric that tells us how fast the storage system responds to a request. Just like with supercars, the lower the time, the faster the car and the storage system. Our goal was to determine if average read and write latencies remained under .5 ms. Looking at IOPS and latency together brings us to our overall test objective. Can this SQL Server solution remain fast (low latency) under a heavy IOPS load? To answer this question is to understand if the database solution can scale. Scalability is the capability of the database infrastructure to handle increased workload with minimal impact to performance. The greater the scalability of the database solution, the more workload it can support and the greater return on investment it provides to customers. So, for our tests to be meaningful we must show a significant load; otherwise, the database system has not been challenged in terms of scalability. We broke the achievable IOPS barrier of 220,000 IOPS by more than 55,000 IOPS! In large part, the PowerEdge R840 servers enabled the SQL Server databases to really push the OLTP workload to the XtremIO X2 array. We were able to simulate overloading the system by placing a load that is greater than recommended. In one respect we were impressed that XtremIO X2 supported more than 275,000 IOPS, but then we were concerned that there might have been a trade-off with performance. The average latency for all physical reads and writes was under .5 ms. So not only did the SQL Server solution generate a large database workload, the XtremIO X2 storage system maintained consistently fast latencies throughout the tests. The test results show that this database solution was designed for performance scalability: The system maintained performance under a large workload across 16 databases. Figure 3 summarizes the test findings. The capability to scale without having to invest in more infrastructure provides greater value to customers. Would I recommend pushing the new SQL Server solution past its limits like Dell EMC Labs did in testing for scalability? No. Running database tests involves achieving a steady state of performance that is uncharacteristic of real-world production databases. Production databases have peak processing times that must be planned for so that the business does not experience any performance issues. Dell EMC has SQL Server experts that can design the Ready Solution for different workloads. In my opinion, one of the key strengths of this solution is that each physical component can be sized to address database requirements. For example, the number of servers might need to be increased, but no additional investment is necessary on XtremIO X2, thus, saving the business money. 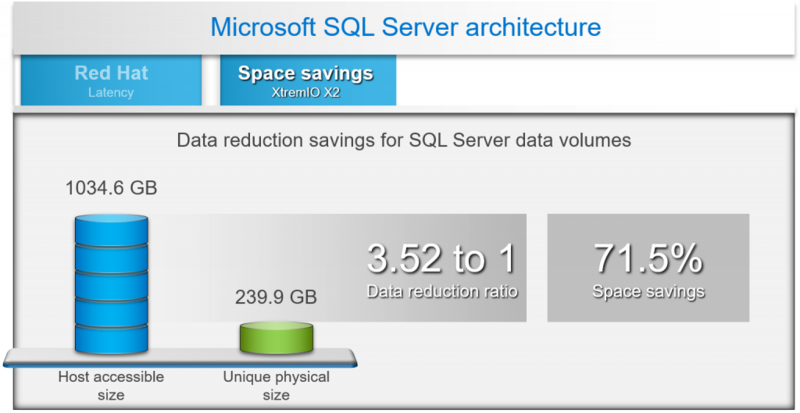 If I were to address just one other topic, I would pick the space savings achieved with a 1 TB SQL Server database. In figure 4, test results show a 3.52-to-1 data reduction ratio, which translates to a 71.5 percent space savings for a 1 TB database on the XtremIO X2 array. Always-on inline data reduction saves space by writing only unique blocks and then compressing those blocks to storage. The value of inline data reduction is the resulting ability to consolidate more databases to the XtremIO X2 array. Are you interested in learning how SQL Server performed on Windows Server Datacenter edition and Red Hat Enterprise Linux Server? I recommend reading the design guide for Dell EMC XtremIO X2 with PowerEdge R840 servers. The validation and use case section of that guide takes the reader through all the performance findings. Or schedule a meeting with your local Microsoft expert at Dell EMC to explore the solution. Why Ready Solutions for Microsoft SQL? The Ready Solutions for Microsoft SQL Server team at Dell EMC is a group of SQL Server experts who are passionate about building database solutions. All of our solutions are fully integrated, validated, and tested. Figure 5 shows how we approach developing database solutions. Many of us have been on the customer or consulting side of the business, and these priorities reflect our passion to develop specialized database solutions that are faster and more reliable. I hope you enjoyed this blog. If you have any questions, please contact me.